Conservation education is extremely important in helping people of all ages understand and cherish our nation’s natural resources. It helps instill good conservation practices today for future generations. Educating youth and the public about the value and benefits trees and forests provide is critical to managing our landscapes for the future. To help you in this important endeavor, Arizona-specific educational materials are provided in this section. Explore the links below and help us promote conservation education throughout Arizona. Discover the Forest - aims to inspire tweens (aged 8-12) and their parents to re-connect with nature, experiencing it first hand. 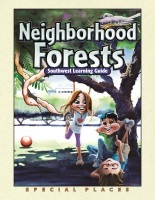 Neighborhood Forests - a learning guide developed for teachers to plan lessons and activites for students to understand the importance trees play in our communities. The Natural Inquirer - is a middle school science education journal! Scientists report their research in journals, which enable scientists to share information with one another. Footprints Conservation Society - provides well rounded, captivating programs for children that include workshops, guest speakers, fieldtrips, community projects and environmental education packets. Kids for Saving Earth: is to educate, inspire, and empower children to protect the Earth's environment. Kids for Saving Earth provides educational materials, posters, and a highly acclaimed web site featuring environmental education curriculum and activities. Arizona Association for Environmental Education: strives to enhance the quality, scope, and effectiveness of environmental education in Arizona, working with diverse audiences to promote professional development, networking, and collaborative relationships. American Conservation Experience (ACE): has emerged as a national leader in recruiting, coordinating, and training volunteers to undertake practical environmental restoration projects in America's national parks, forests, wildlife refuges and other public lands. Keep Arizona Beautiful: supports local community cleanups, recycling events and beautification projects throughout Arizona. The Arizona Wilderness Coalition's (AWC): mission is to permanently protect and restore Wilderness and other wild lands and waters in Arizona for the enjoyment of all citizens and to ensure that Arizona's native plants and animals have a lasting home in wild nature. AWC coordinates and conducts inventories and educates citizens about the unique features of Arizona's landscape, while advocating and building support for their lasting protection.